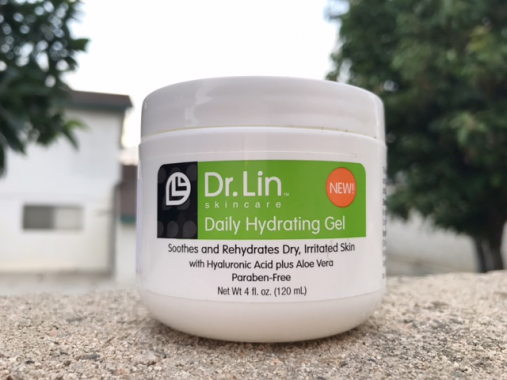 Hello everybody, I’m finally getting around to the Dr. Lin Hydrating Gel moisturizer I promised I would review in my how to treat acne article. As you may have guessed, I recommended it in that blog post because it’s one of the only products that can truly claim it won’t make even the most acne-prone individuals breakout. Let’s waste no time and get into it! 1 Dr. Lin Hydrating Gel Ingredients and Benefits. 2 Who is Dr. Lin Hydrating Gel Best For? 3 Application Feel And Scent. 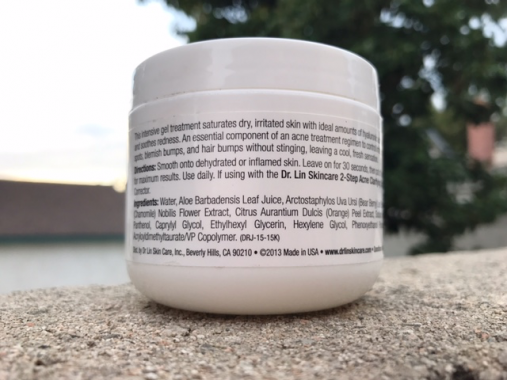 Dr. Lin Hydrating Gel Ingredients and Benefits. Water, Aloe Barbadensis Leaf Juice, Arctostaphylos Uva Ursi (Bear Berry) Leaf Extract, Cucumis Sativus (Cucumber) Fruit Extract, Anthemis (Chamomile) Nobilis Flower Extract, Citrus Aurantium Dulcis (Orange) Peel Extract, Sodium Hyaluronate, Glycerin, Pentylene Glycol, Allantoin, Arbutin, Panthenol, Caprylyl Glycol, Ethylhexyl Glycerin, Hexylene Glycol, Phenoxyethanol, Polysorbate 20, Sodium Hydroxide, Carbomer, Ammonium Acryloyldimethyltaurate/VP Copolymer. Aloe vera’s uses for skin date back over 3500 years because of its anti-inflammatory, anti-septic, lightening, and healing properties. It’s also a good source of antioxidants and some studies have shown it may treat psoriasis. Also known as hyaluronic acid. A very effective humectant that moisturizes the skin by binding water to its surface from the deeper layers (dermis) and atmosphere. It’s actually considered one of the most powerful humectants available because it can hold up to 1000 times it’s water weight. It does such a good job of increasing hydration that it notably causes a “plumping effect” that reduces the appearance of fine lines and wrinkles. And better yet, studies have shown it’s a very effective wound healing agent. Like hyaluronic acid, This is another humectant that helps bind moisture to the skin by slowing down the rate at which water evaporates from the epidermis. A byproduct of urea, which is an effective keratolytic agent that hydrates the skin and sloughs off dead skin cells. It’s used in cosmetics because it has soothing and moisturizing effects, and is ideal for those with sensitive skin. An extract and safer form of hydroquinone, that’s used for its skin lightening properties. It’s a very effective tyrosinase inhibitor, meaning it suppresses the production of melanin, or the pigment that makes conditions like hyperpigmentation worse. This is a great ingredient if you’re looking to fade discoloration or fix uneven skin tone! A form of vitamin B5, and skin moisturizer that reduces transepidermal water loss (TEWL), or more simply put the evaporation of water content from the skin. To keep skin moisturized you want to make sure that it retains as much of its water content possible. Not doing so is what actually leads to dryness and skin tightness. There is also some evidence that panthenol promotes keratinocyte differentiation, meaning it helps keep the surface of skin healthy by making sure everything is functioning optimally on a cellular level. Some studies have also shown that it may help treat dermatitis (inflamed, dry, scaly skin) and burn injuries. Something that’s really nice about this formulas is that it has 4 extracts! For a quick refresher of what extracts are — they’re basically a solution made by soaking an herb in alcohol for a period of time, which infuses some of its botanical benefits in the liquid itself. Bearberry = has antioxidant properties and may help brighten skin. Cucumber = also has antioxidant properties, in addition to trace amounts of minerals and vitamins like silica and ascorbic acid, which could prove useful for skin brightening. Many people also report that cucumber extract has a very soothing effect on the skin. 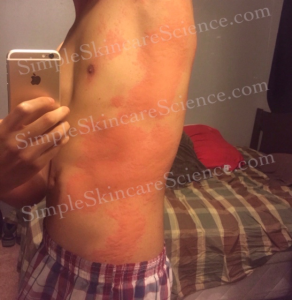 This is what probably causes the “cooling” sensation many experience when applying Dr. Lin Hydrating Gel. Chamomile = like most plant extracts this also has antioxidant effects, and studies on mice have shown it has very strong skin soothing capabilities. Orange peel extract = there currently isn’t any research on this, so anything I say is pure speculation. But some people do claim that it may be irritating on the skin, particularly for those that have extreme sensitivities. As far as the ingredient list goes, the orange peel extract is the only negative aspect of this formula. But by far and large, it doesn’t seem like this ingredient irritates most people. Especially considering how well Dr. Lin Hydrating Gel is tolerated by even the most acne-prone individuals. And that does it for this gel formula! Who is Dr. Lin Hydrating Gel Best For? You may have noticed Dr. Lin Hydrating Gel has a very basic ingredient list free of any oils and emulsifiers. That’s probably the main reason so many acne-prone people report success with it. In other words, it’s not so much what’s in it, as much as it what’s not. The reason this formula works very well, is because it cuts down on a lot of unnecessary ingredients that could potentially clog pores or irritate the skin (e.g. denatured or fatty alcohols). This really is as basic as it gets. 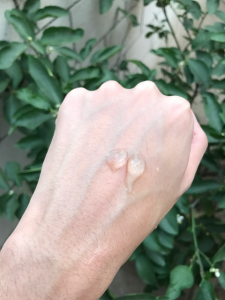 The only other moisturizer that I can think of that’s simpler than this one is the Sebamed Clear Face Gel (full review here). 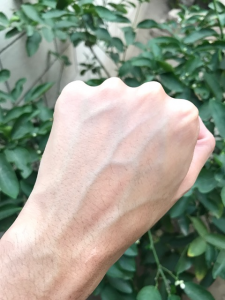 With that said, I think Dr. Lin Hydrating Gel is ideal for those that absolutely break out from everything, or whose skin can’t tolerate most products. However, because it isn’t the most hydrating moisturizer (more about this in a bit), it is better suited for oilier skin types. In general, when people ask me for advice because nothing is working for them, I recommend Sebamed Clear Face Gel, but Dr. Lin Hydrating Gel is a close second. 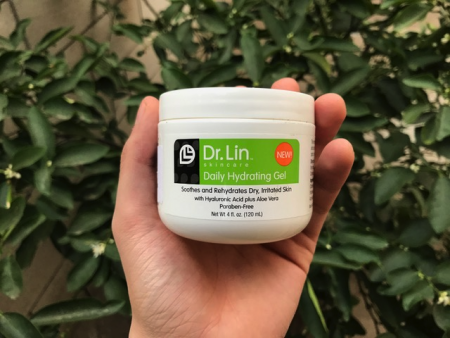 If you’re stuck trying to decide between which one is better, it really just comes down to the fact that Dr. Lin Hydrating Gel includes arbutin, additional plant extracts, and polysorbate 20 which could feed malassezia (yeast). 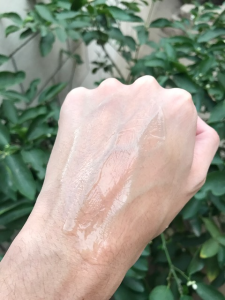 In other words, it might have additional benefits over Sebamed Gel like lightening dark spots, but that comes at the cost of the extracts being possibly irritating, or polysorbate 20 breaking out skin that’s sensitive to malassezia. Because I’ve only used Dr. Lin a few times, I’m going to rely mostly on what my sister has to say about it in terms of its feel on the skin. Given that this is her current moisturizer and one that she has used for a couple months, I think she’s way better qualified than me to talk about the pros and cons here. Like me, she breaks out from most products and this has been the only thing that works for her. Without further ado, here are her exact words when I was interviewing her on the phone. Question: How does it feel on the skin when it goes on? Question: Do you find it moisturizing enough? “I mean…. It does the job. It’s better than nothing, but it doesn’t provide a lot of hydration. Question: How do you think it can be improved? A very basic formula that is well tolerated by almost everyone, and particularly excellent for those that are acne-prone. It contains four different plant extracts that can help soothe the skin, in addition to having arbutin, aloe vera, glycerin, and hyaluronic acid. Provides a little bit of hydration, and brightens skin tone and treats discolorations like hyperpigmentation because it contains arbutin which Inhibits tyrosinase (an enzyme that controls the production of melanin). It comes in a jar, which isn’t the best packaging considering it could easily become infested if you stick your dirty little hands in it! Sorry to sound like a mom, but just make sure to wash your hands before using it, or simply scoop it out with a little spoon. Pro-tip: these can be stolen from your local ice cream parlors. Fantastic price, super affordable, and the jar will last you a very long time. Fantastic value. Overall this is a very solid but basic gel based moisturizer that’s best suited for the most acne prone individuals out there that experience breakouts or reactions from almost every skincare product. It isn’t the most hydrating product in the world, so I recommend it for those with oily skin. Drier skin peeps will find this product doesn’t provide nearly enough hydration. Help your friends or family members who break out from everything by sharing this review!